Easily accessible from four major roadways on Ski Mountain in Gatlinburg, Tennessee is the mountain resort community of Chalet Village. Residents are close to countless opportunities available at Ober Gatlinburg Mountain Ski Resort, Ripleys Aquarium, Dollywood, Outlet Mall shopping, Splash Country, numerous restaurants and other attractions. Many recreational options are also available at the Great Smoky Mountains National Park, which lies adjacent to Chalet Village. It is not unusual to see people hiking, biking, rafting, fishing or enjoying any number of other activities. Chalet Village is in the center of all the fun of the eastern Tennessee mountains. Located in the state of Tennessee at its eastern-most edge lies Sevier County, home to a massive tourist destination centered around The Great Smoky Mountains National Park. If you follow U.S.Hwy 441 down through the county, marvelous vistas of the Smoky Mountain lure you onward. As you reach the intersection of Hwy 441 and Hwy 321 you are getting close to the National Park and the Gateway Community of Gatlinburg. Gatlinburg is often called the “Gateway to the Smokies” for good reasons. Following U.S. Hwy 441 takes you downtown into Gatlinburg and from there into The Great Smoky Mountains National Park. Hwy 441 climbs in elevation as it scales some of the highest peaks of the Eastern United States and then works its way into North Carolina down into Cherokee. Gatlinburg is magical in its attractions and in many other aspects as well. This tiny city may very well have been lost such as many remote southern rural towns. However, the creation of the Great Smoky Mountains National Park changed the destiny of this city immediately. Restaurants and hotels sprang up rapidly to accommodate the influx of tourists coming to see the “Nation’s Most Visited National Park”. Hemmed in by mountains on all sides, Gatlinburg is never at a loss for magnificent views. The lush hardwood and coniferous forests carpet the areas outside of town. Clean, rocky, boulder-strewn creeks and rivers run through the city with a beautiful zen-like quality. Wild life such as; deer, boar, black bear, and turkey roam the area even into the city. Ober Gatlinburg gives the city the allure of being a ski resort/winter sports center. Year-round activities and festivities keep this tiny burg hopping. Despite the nightlife, the topography of this location makes it easy to access the city amenities and within minutes you can escape to the seclusion of your own private residence, condo, or rental cabin. Gatlinburg is rare. It has all the amenities of a large city from; restaurants, fine dining, hotels, convention accommodations, shopping, amusements, entertainment and more. The beauty of Gatlinburg is that it is still rooted in its humble beginnings. The city is; fun, friendly, and most importantly, it is affordable. In today’s cash-strapped economy, it lies less than 10 hours from over 1/2 of the U.S. population so it is America’s understated getaway destination. 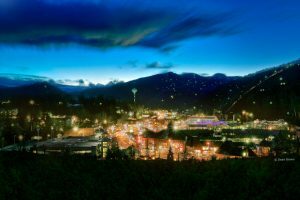 Easily accessible from four major roadways on Ski Mountain in Gatlinburg, Tennessee is the mountain resort community of Chalet Village. Residents are close to countless opportunities available at Ober Gatlinburg Mountain Ski Resort, Ripley’s Aquarium, Dollywood, Outlet Mall shopping, Splash Country, numerous restaurants and other attractions. Many recreational options are also available at the Great Smoky Mountains National Park, which lies adjacent to Chalet Village. It is not unusual to see people hiking, biking, rafting, fishing or enjoying any number of other activities. Chalet Village is in the center of all the fun of the eastern Tennessee mountains. Chalet Village offers homeowners exclusive resort communities that are great for second homes, investment properties for rentals, or full-time residency. Homebuyers in Chalet Village can find older single family homes, chalets, condos or breathtaking new and luxurious log cabin homes. If you are wishing to build a custom home, lots and land are readily available and provide breathtaking views of the mountains surrounding Chalet Village. The prestigious Chalet Village, with around 2,000 residential/rental lots, is the last community before entering the Great Smoky Mountains National Park. 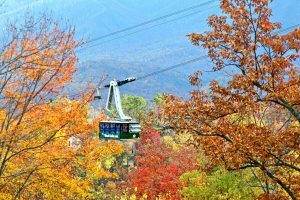 Not only do residents enjoy breathtaking views of mountain peaks, but also spectacular views of Gatlinburg and the ski slopes at Ober Gatlinburg Mountain Ski Resort, which is located in the village. A route of the Gatlinburg Mass Transit runs over Chalet Village and makes stops within the national park. Despite its close proximity to Gatlinburg, the community is nestled and secluded in the never-ending mass of forests for the ultimate in privacy and peacefulness. Three main sections make up Chalet Village, and these neighborhoods offer the best amenities including tennis courts, swimming pools and playgrounds. The main subdivisions of the Chalet Village area adjacent to Gatlinburg are Alpendorf, Chalet Village North and Tryolea. Residents of Chalet Village are served by the Sevier County School System. For residents of all ages, The Arrowmont School of Arts and Crafts, established in 1945, is world renowned for arts and crafts instruction. It is located within minutes of this charming mountain hideaway. Set in a serene and quiet environment, yet surrounded by big city amenities and recreation, Chalet Village offers the finest choices in mountain living amidst the blue mist of the Great Smoky Mountains range. Located 12 miles from Sevierville and seven miles from Gatlinburg, Pittman Center is home to less than 600 full-time residents. Although it’s small in size, the tiny mountain town of Pittman Center is growing due to its ideal mountain location and close proximity to the countless attractions of the surrounding Sevier County region. Residential homes in Pittman Center are typically comprised of single family homes or secluded mountain luxury estates all designed, built and maintained in an effort to respect the surroundings, preserve the past and make the future one that is economically sound. In 1784, this secluded mountain region was first settled by Fredrick Emert and rightly named Emerts Cove. In the early 1900s, a Methodist missionary saw the need for education and healthcare in the region and oversaw the construction of a community center and school to be named after a friend by the name of Pittman. This very small and slow-paced town was incorporated in 1974, and the name Pittman Center became official. The town is roughly six square miles. Despite the small scale of the town, Pittman Center is large in life and boastful of one very prestigious award as being a “Distinctive Destination” from the National Trust for Historic Preservation for “providing enjoyable national, historic, aesthetic, recreational and cultural experiences for people of all ages.” Pittman Center has preserved the roots of the mountain heritage, resisted commercialization and urban sprawl, yet still supports growing tourism of the Great Smoky Mountains. The strong leaders and residents of Pittman Center have taken their job seriously to protect this piece of paradise with strict zoning, a commitment to the region’s history, and diversity in architecture and economics. Pittman Center is a town worthy of its award, and it is a location homebuyers will be proud to call home. Residents celebrate their charming town by showcasing it during the local Pittman Center Heritage Day held in September each year. Pittman Center is nestled in the Great Smoky Mountains and near the sparkling waters of the Little Pigeon River. The portion of the river traveling through Pittman Center has been named one of Tennessee’s cleanest waterways and given the recognition of being an Outstanding National Resource Water. It is the only river, outside of the National Park, with this award. This is another testament to the citizens of this fine community for their support of the environment and Pittman Center as a whole. Another example of community preservation is a city-wide ordinance that stresses natural wood signs. This ordinance, supported by the townspeople, encourages their effort in keeping the look and the feel of Pittman Center a mountain town, not an amusement park. 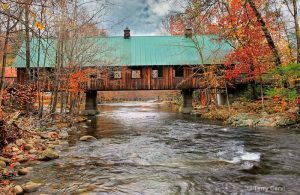 Pittman Center, with the charm of its covered bridge, is a mountain escape in a serene setting. Residents feel secluded from the chaos of the modern world without giving up an easy and breathtaking drive to all the amusements and recreational resources that eastern Tennessee has to offer. This includes direct access to the National Park through the Greenbrier entrance within the city limits. Pittman Center, Tennessee is truly a mountain getaway in the heart of the Great Smoky Mountains offering homebuyers the best options in modern living with every possible amenity and convenience, yet in a setting so relaxing and quiet, it is a well-planned step back in time. Request our Free Gatlinburg, Pigeon Forge, and Sevierville Relocation Package. It’s packed full of useful and important information about the Gatlinburg, Pigeon Forge, and Sevierville, Tennessee area.